: Thank gawd! Finally, a familiar face! : I gave him medical treatment since he was wounded and unconcious... But he woke up in the middle and went nuts, so we had to lock him up in the storehouse. 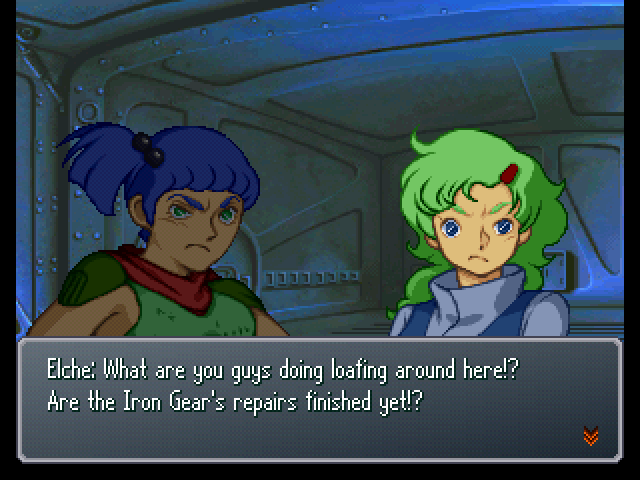 : Oh, so Boss wasn't being taken prisoner or anything. 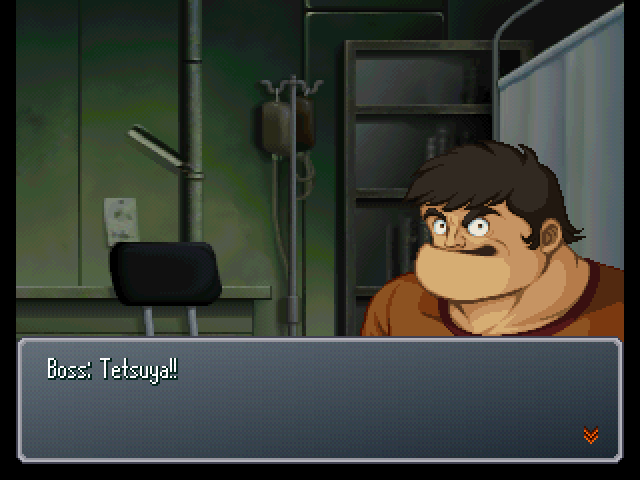 : So, Tetsuya. Where the heck are we? : ...First, can you tell me if you've seen any of the others? : Nope... We're the only ones here, far as I know. : I don't suppose you guys are with the Innocent, then? : What are these... Innocent? : You don't know who the Innocent are? And here I thought you were weird enough because you didn't seem like Breakers... Eh, whatever. The Innocent are these guys who live in domes... They give us all our basic necessities and walker machines. : They sound like nice enough people. : ...They would, wouldn't they? 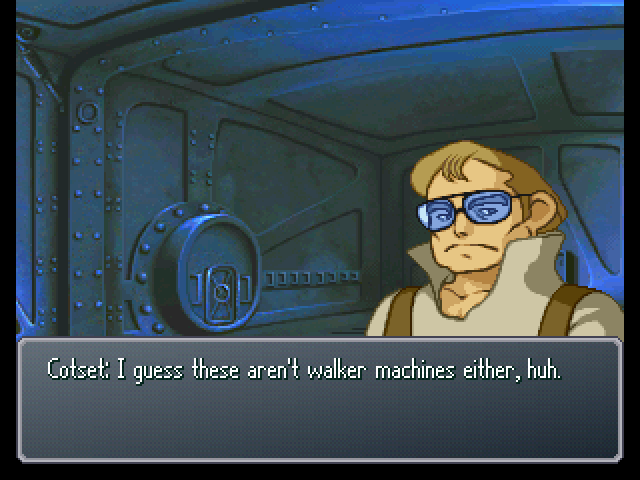 : By the way, what's a walker machine? : A humanoid machine used for things like transportation, blue stone mining, and fighting. : ...Never heard of it. : I'd thought that thing with the eyeballs attached was a walker machine... Guess I was wrong. : That's my Boss Borot. 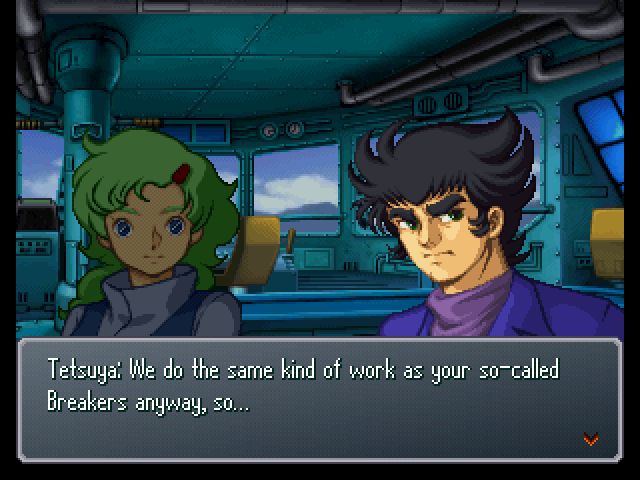 Tetsuya's got Great Mazinger, and Jun's got the Venus A.
: Tee-vee? News? What are those? : Tetsuya... What the heck is all this? : And the robots these guys're in... They're like glorified rustbuckets! : Yes, and even the town looks like something straight out of a wild west movie. : We're not in Kansas anymore... That much is plain to see. We're in another world. : So where is this world? : I can't say... That's why we need to investigate. : The fact that you came here too, seperate from me and Jun, means... There's a very good chance that it's the same way for the others. : Yes, and if we're in another world, we need to find a way back to our own. : Right. Let's stay with this ship for a while and gather more information. : What was it called again? Great something-or-other? I've never seen a walker machine so huge before. : But they said they aren't with the Innocent. : Are they Breakers, then? : Could be. These things are unmistakeably built for combat. : S-sorry, Milady. I'll get right on it! : Hey, you too, guys! : What, you want us to help out? : Of course I do! You work for me, remember? No work, no compensation! : You can't fix it completely? Oh well... Have the ship depart for the Innocent's payment point. : Tetsuya, right? You don't mind working on my ship too, right? : Then you could do work as a bodyguard, right? 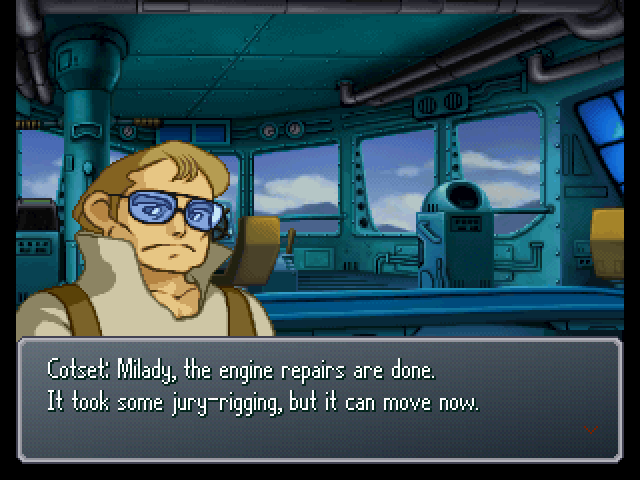 : Okay, but we won't be on the ship for too much longer. I'd also like for you to provide any needed information. : Sure. I'll tell you anything you want to know about culture or whatever else. : Yes, it's something that the Innocent have. My dream is to make the aromatic flower of culture blossom all over the Earth. : You look like you want to ask something. : Okay, I'll bite... What is this payment point you guys are headed for? Suddenly, the Iron Gear is under attack! : We've got some unfriendlies! A gang of Breakers is attacking us! : Does this kind of thing happen a lot? : Eh, kinda. They've been getting more frequent lately. : Well, this ship IS a top-of-the-line Innocent landship. There are plenty of people who'd attack us to take it. 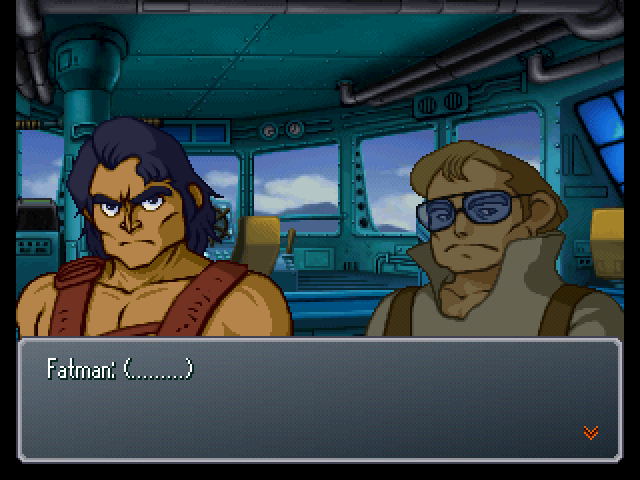 : And it's got a greenhorn female captain, on top of that. It must seem like easy pickings to Breakers down on their luck. : Oh, be quiet! If you've got the time to yap, then get to work!! : We know that! You don't have to get all fussy! 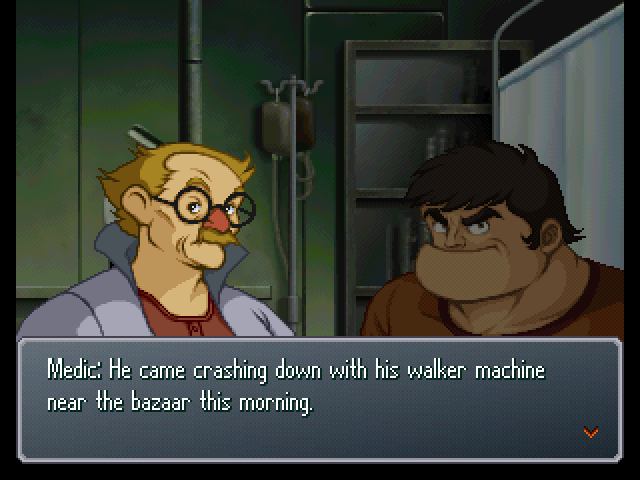 Burume, we're taking the walker machines! : Cotset, notify everyone on board to assume battle stations!! : You too! Quit loafing around and get ready!